Receuil des progres spiritualistes, ou etudes sur les manifestations du spiritualisme moderne / echo spiritualiste et humanitaire. Paris, France. Language: French. Publisher: La Nouvelle Librairie. Editor: Auguste Fauvelle Le Gallois. 1/1, 1864-1868(?) The journal was said to have been published as late as 1872. 6-8 francs for the proposed series; 50 centimes per issue. Alexis Dureau in his Notes bibliographiques pour servir a l'histoire du magnetisme animal (1869) says that this was intended originally as a series of pamphlets to be issued approximately monthly and then became what was promised as a regular, monthly journal in October 1866. Apparently 18 of the original pamphlets were published. Fauvelle Le Gallois was a musician (he composed "La Somnambule spiritualiste" among other musical works) and early spiritualist who also published a Petite encyclopedie magnetique pour tous and L'Avenir, almanach complementaire (1868) as supplements to the journal. Dureau describes him as ambivalently received by the magnetists, some seeing him as an enthusiast and dreamer and some as an oracle. The journal featured articles on Fauvelle Le Gallois's achievements in magnetic and spiritualist circles in Paris in the 1850s, when he founded the annual Banquet universel de la Pentecote magnetique. 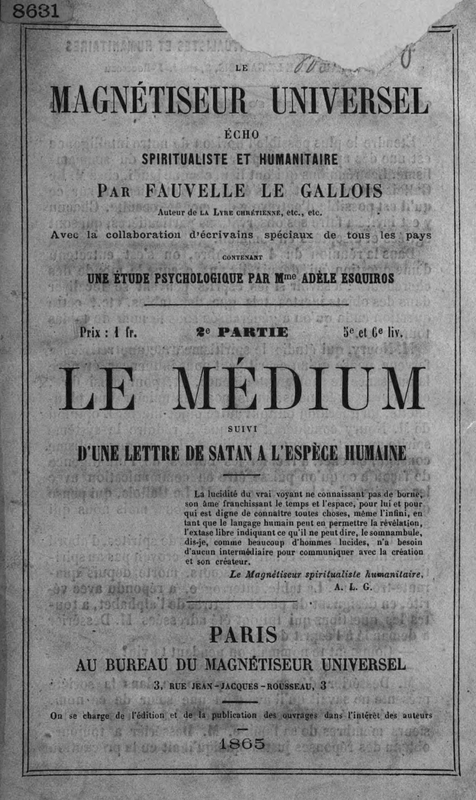 It does not mention his arrest at the time (recorded in the Journal du magnetisme) for divination for publishing an advertisement that offered "Magnetism and universal lucidity with Fauvelle Le Gallois, the humanitarian magnetist, author of La Somnambule spiritualiste, of Salutation a Jeanne d'Arc and of La Lumiere a traves les ages . . . from 9:00 until 6:00 daily." The journal featured "A Letter from Satan to the Human Race." An advertisement for the journal in Revue Contemporaine in 1868 indicates that Fauvelle Le Gallois may have been interested in the role of sexuality in magnetism: "My magnetic cult, where God reigns, realized by science united with love and humanitarian spiritualism . . . The fluid of love and of universal harmony." BL; BNF.